The Assemblyman is working with local law enforcement who are looking into the matter. Further announcements will be made as this story develops. I learned the hard way ,couple of years ago i rented my 2 car garage before pirim,the guy didnt bargain on price and paid 1 month security and 2 months rent up front.. I was all excited till after 2 months passed with NO rent i called his cell which of course was long disconnected...After few days i opened up and saw my CHORBEN. Last time it was digging up someone else's property and leaving the shaimos piled high, and now abandoning the truck after taking everyone's money. Wonderful. The concerned resident of the community who called Dov Hikind's office should be given a "hartzika skoiach" for bringing this travesty to the public's attention. People collecting "shaimos" should get a city permit and a valid "hechsher" from an reliable source before engaging in this "dovor shebekdusha". How low can these scammers get. What chillul Hashem. Literally. A shanda. Assuming that it's a rental truck, it should be easy to determine who rented it. With the minimum charge of $10 for a shopping bag collecting Shamos is quite a lucrative business even if you pay to bury it properly. I hope the Assemblymember releases the names of those responsible for this. The shaimos business for some is a sham. I spoke with a friend who operates such a "business"
what they do is charge for the bags-- and then they decide if it is shaimos. Such as if you give a bad of Tzitiz or Newspapers, and they "hold" you can just double wrap it and throw it out-- that is what they will do. Basically, for you paying $70 they will double wrap it for you. the real question is that you may be a מסיע לדבר עבירה because in this country it is illegal to bury paper, and thus you are having them do something illegal... what is the option?? who knows? But yes-- they should have a הסכמה on them! 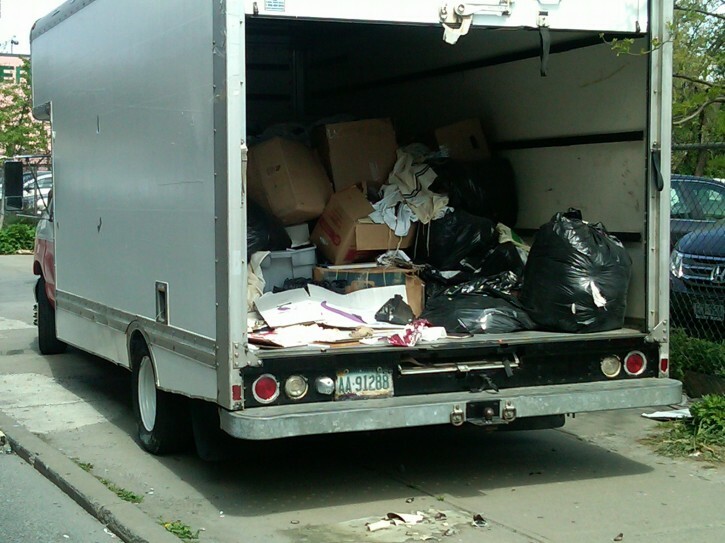 There is no legal basis for the city to regulate "shaimos" collectors. The stuff should be collected like any other trash or waste and discarded repectfully in a landfill in accordance with halacha. The city has no basis to decide what is legitimate shaimos and how to dispose of it. “ The shaimos business for some is a sham. By the way, some poiskim hold most of what we would call shaimos just need to be thrown out with more kavod than junk (double wrapping) that's why this is such a big moneymaking business. I didn't have time to go through my shaimos box so I just gave it into a truck without checking through the bag. This is not to excuse those scammers who don't have a poisek telling them what can just be tossed. we should find out who this chayya is and dump the shaimos in his front yard. The gemorah already tells us that is you don't teach your children a trade you are teaching them thievery. Enough said. Where were the police all these three weeks when the truck was just sitting there abandoned on the sidewalk? In these times where terrorism is a real threat, a box truck abandoned and parked on the sidewalk getting ticketed daily doesn't arouse suspicion to find out what's in there? It took a resident to alert the authorities? After three weeks? Scary!! You have it all wrong. The Rabbonim will accuse him of loshan hara, kick him out of the shul, and treat him like a leper. Stay unknown! It's very simple. These guys know that someone will not let this shaimos go in the trash. Just as all the frum ganovim who dump shaimos in shuls. All this is now being changed with the establishment of the Beth Genizah Cemetary in Liberty, New York. The cemetery is overseen by the Vaad L’mishmeres Hashaimos, under the personal directorship of Rabbi Yosef Schwartz. The Vaad purchased over 25 acres specifically for this purpose, causing a breakthrough that is being applauded by the entire frum community. A solution to the troubling Shaimos situation is finally being implemented! The Beth Genizah is under the strict rabbinical supervision of the CRC (Hisachdus Harabbonim) and the OU. In addition, all procedures are pre-authorized by pertinent state and local agencies to ensure full compliance with the law. Beth Genizah is equipped to deal with large quantities of shaimos, servicing shuls and yeshivos by request. They also provide services to individuals, handling each and every piece of shaimos with the dignity and respect it deserves. The site of the cemetery is visible to those traveling to the Catskills, and visitors are welcome. The entire operation conforms to the rigorous standards of the DEP, whose requirements caused major problems in the past with proper shaimos disposal. Since this isn’t a once-a-year venture but a continuous service, it is no longer necessary to wait with shaimos internment for Erev Pesach. The Beth Genizah can be contacted all year round, and they accept shaimos for burial any time with advance notification. this was a poor boy who could not make it only few bags full. I don't get it. There are trucks with young people accepting drop offs of shaimos parked on city streets for days at a time. Isn't there some sort of regulation on street vendors? If they began selling sandwiches, the city would jump on them for fees and taxes. I'm not looking for additional expenses, and certainly not govt regulation. But there needs to be some level of accountability, and this would be one way to maintain a list and record of who is using which vehicles and where. The city cannot mandate hashgachos. But there should be some way of tracking who is taking responsibility for shaimos. Gosh, we have found chumros for everything else. Why not shaimos? 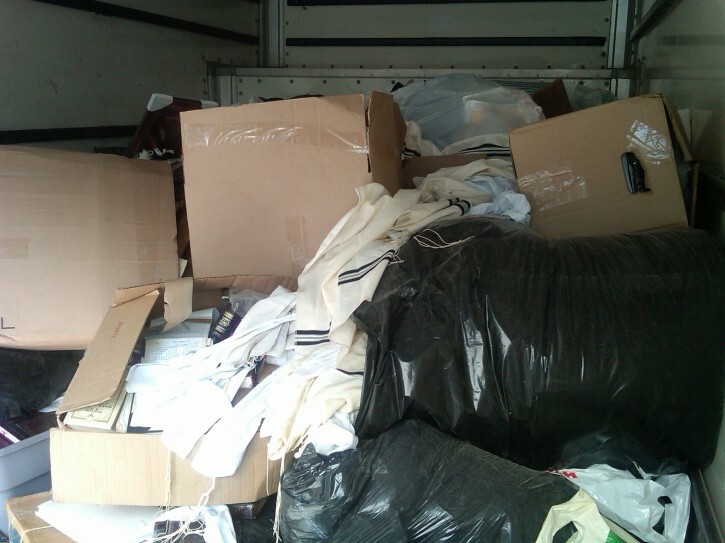 I think it's also high time that the organizations that flood our shuls with torah bletlech every week own up and collect them back otherwise shuls should forbid them to dump on them.... Or perhaps shuls should pack it all up after shabbos and ship it back to where it came from we'll see how long they'll keep sending it out. “ I learned the hard way ,couple of years ago i rented my 2 car garage before pirim,the guy didnt bargain on price and paid 1 month security and 2 months rent up front.. This one did have a name of a dayan, but he denies knowing anything about it. I understand that al pi halacha shaimos collection and proper burial is the responsibility of the community at whole, not to each his own. see shulchan aruch. did you see the guys in charge of these trucks? hardly heimish! definitely not our children. Oh ya! I cant wait till this will be on Rabbi nuchem rosenbergs hotline!! Why? What does the "Vaad L’mishmeres Shaimos" have to hide or to cover up at its cemetery? Where do you get that from? Where on the truck do you see a name of a dayan Avrumele? Visiting the cemetery without an appointment is an invitation to free-lance shaimos disposal. The gentleman that operated the vehicle in the picture may then easily have "visited" the shaimos cemetery and just left his load there. Kapish?? I don't see the problem with this. Do you expect someone to be available at the cemetery 24/7 to show you around? I think it makes perfect sense to do schedule appointments for visits. Or am I missing something? "People collecting "shaimos" should get a city permit..."
This is what living in New York Soviet Socialist Republic does to once (presumably) normal Jewish brain? That you can't conceive of any activity that could be conducted without government's permission? Yes, you might "be missing something". Jewish cemeteries have their gates wide open to visitors five (even six, sometimes) days a week. Shabbatot and yamim tovim are excepted, of course. Therefore I ask what are the owners hiding? Perhaps if someone would take the trouble to go there he/she might (note that I wrote "might") find boxes of shaimos lying on the ground and rotting in the rain, just like at a public landfill site for household and industrial garbage, with no one bothering to bury those shaimos kedat ukedin. Apparently the name of the dayan was gleaned from crumpled flyers found with the trucks. Both the BP & Willie trucks had signs with a Florida phone number and the name of a local, respected dayan. what people will do for money? are you serious? lol. ever been to a yeshiva? that is the U Haul location from where the truck probably came from. I wonder where you get your facts from, because I know that you are factually incorrect. There were no flyers, nor Florida phone numbers, nor names of any Dayan at the abandoned Boro Park truck. Check your facts again. “ that is the U Haul location from where the truck probably came from. The uhaul rental place is quite a few blocks away from where this truck was found, and the truck was not rented from uhaul altogether.